The birthday of famous Russian chemist and inventor Dmitri Ivanovich Mandleev was celebrated at Multani Mal Modi College with great enthusiasm by organizing a special function. Dr. Rajeev Sharma, Dean Research of the College expressed that Mendleev discovered the periodic table which is the back bone of modern Chemistry. Dr. Khushvinder Kumar, Principal of college, welcomed the chief guest and speaker Dr Mourad Harir, a Scientist,Helmholtz Zentrum from Munich, Germany and Prof. Ashok Malik from department of Chemistry, Punjabi University, Patiala. While welcoming the guests he explained the need for scientific research, particularly in Chemistry, by calling it the mother of all sciences in our society. Dr Mourad Harir delivered a highly illuminating talk on natural organic matter analysis by using FT-ICR mass spectrometry. He said that man has caused a great havoc to the environment but the techniques like mass spectrometry can be used for detection of environmental pollutants in the environment produced due to burning of biomass. Prof. Ashok Malik explained that how the excessive and non judicious use of chemical fertilizers, pesticides and insecticides has polluted the air, water and food items. He also discussed the use of simplified techniques for estimating these pollutants and role of chemistry in eradication of pollution. Dr. Meenu Arora presented the vote of thanks. 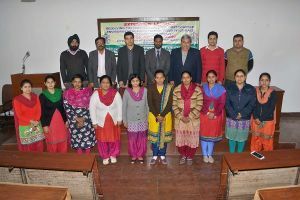 Dr. Anupama Parmar, Dr. Harjinder Singh, Sanjeev Kumar, Chitrangna, Chitranshi, Kashish Jain, Manpreet Kaur, Ravneet Kaur, Milanpreet Kaur and Priyanka were also present on this occasion.